The monthly water balance in gaps in a managed Dinaric silver fir–beech forest and a virgin forest remnant located in SE Slovenia was modelled using a capacity water balance model for two growing seasons. Two gaps of different size (ca. 0.07 and 0.15 ha) were selected in each forest and plots for soil moisture monitoring were established in each gap (2–4) and in the surrounding forest (2–3). We report on the modelled actual evapotranspiration (AET) and potential evapotranspiration (PET) and drainage fluxes (DF) from the rooting zone at the plots. Precipitation over the 2001 growing season (May–October) was considerably drier than average and that for 2002 growing season was wetter than average. Modelled AET for the 2001 growing season varied between 88% and 96% of PET for the managed forest plots and between 90% and 100% for the virgin forest plots. The values for the gap plots varied between 87% and 100% at the managed forest site and between 92% and 96% for the gaps in the virgin forest site. Monthly AET values declined to 57–59% of PET at plots in the centre of the gaps in the managed forest site and to 63–74% in the gaps in the virgin forest site (July), indicating that the highest drought stress occurs in gap centres. For 2002 growing season, AET for all plots was 100% of PET. Modelled DF values in 2001 were 13–35% of rainfall for plots in the gap centres and 12–16% for plots in the forest at the managed forest site. On an average, gap DF values were 20% (154 mm) higher than the forest plot values. DF values in 2002 were similar for all plots at the managed forest site, 31–33% of rainfall. At the virgin forest site, 2001 growing season, DF values varied between 12% and 30% of rainfall at the forest plots and between 12% and 32% at the gap plots. In 2002, DF values for all plots in the virgin forest site varied between 24% and 38% of growing season rainfall. The varying development of vegetation and forest in the gaps of the virgin forest remnant resulted in more variable evapotranspiration and DF during the drought year 2001, with values not as clearly related to distance from the gap centre as in the managed forest site. 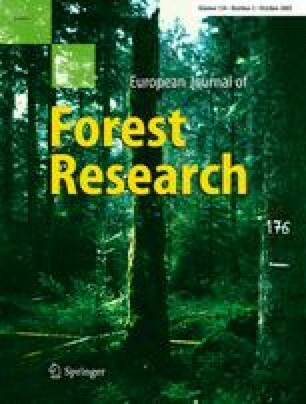 The study was part of the European 5FW project NAT-MAN (QLRT1-CT99-1349), Ph.D. study and Program group Forest biology, ecology and technology (0404–501), financed by the Ministry of Education, Science and Sport, Republic of Slovenia.